Aadi Sharma is one of our continuation sports scholars. Currently at Swanbourne House Prep School he will be joining Stowe in September. 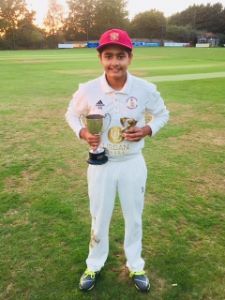 Aadi has had a very good county cricket season for U-12’s Bucks County at the Ipswich MCCF cricket festival. He scored 355 runs in 5 games and set a new record and won the batsman of the tournament award. Overall in the county season he scored 531runs at an average of 66.38 with 6 fifties and 1 hundred. Aadi has been selected as the youngest member of the Emerging Players Programme (EPP) for Northants county cricket. 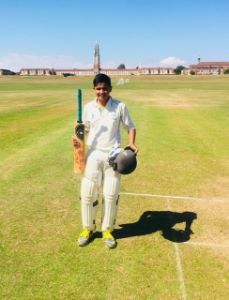 This year Aadi played junior cricket for GBCC for four age groups - U12’s, U13’s, U14’s and U15’s. He also debuted for the second XI adult’s team. He had a remarkable season in all three aspects of the game - batting, bowling and fielding.Detailed stats below, he ranked 1 in all three fields. Batting stats - it’s worth mentioning that in U12 and U13, batsman retires at 30 runs and in U14’s and U15’s, batsman retires at 50. Aadi captained two sides this year - U12’s and U13’s. Both teams won their respective leagues. U13’s also won the ECB T20 County cup. Aadi also won the Wynyard Cup for his performances in a Prep School Select XI.